It takes something a bit special to get us on the road to Edinburgh after 8pm on a weeknight - and something even more special for us to be arriving home in Glasgow several hours later without grudging the journey. But at 1am, we stumbled through our front door glad we had made the effort to see "Kursk". I'd loved the concept of this show since reading reviews of its London run - long before I knew it would be appearing at Edinburgh. Staged in a partially mocked up submarine the audience are invited to take a wide view from a raised metal gangway or find a place to stand or perch at ground level and be right in amongst the action. Despite the title, the focus of the play isn't really the Russian submarine which sank in 2000 with the loss of all 118 souls on board. In fact it's 60 minutes into the 90 minute runtime before the Kursk gets more than a passing reference. Instead the submarine we are find ourselves on is a British vessel - with a mission to monitor Russian navy wargames and the Kursk in particular. And while we witness the events that befell the Kursk at a distance, and there is a short consideration of whether our sub could offer assistance (but thereby revealing its presence in the area), our only real connection with those on board the Kursk is the knowledge that its crew is almost certainly little different from ours. A fact the British crew are all too well aware of. But it isn't the staging or the true life horror that makes "Kursk" noteworthy. It's the characters that Sound&Fury and Bryony Lavery have created. Yes they fall into convenient stereotypes: the jack-the-lad, the prankster with his own worries at home, the inexperienced young captain, the aspiring poet and the proud new father, but it's the relationships between these broadly sketched characters that works so well. There is a genuine sense that these guys have spent time with each other and while they throw around the banter, this is very much a brotherhood. Of course, a large part of that success is down to the performances from the five strong cast. It must be a difficult space to perform in, as the acting needs to be able to withstand close scrutiny from the audience in the immediate proximity while remaining sufficiently broad for those viewing from across the room (or even without a direct sightline). "Kursk" is a truly immersive piece of theatre - both physically and emotionally. Best show we saw at the Fringe this year. 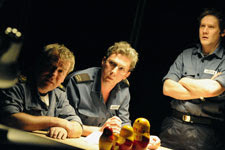 Kursk runs at the University of Edinburgh Drill Hall until Saturday 29th August.